Federated Payments offers cutting edge solutions for the merchant “on-the-go”. Untethered by traditional wired terminals, our low-cost, highly efficient virtual and wireless credit card processing solutions provide you with the freedom, flexibility and convenience to accept credit cards quickly and securely – whenever and wherever you need to from your car or truck. 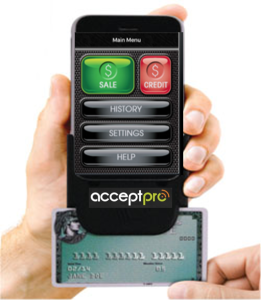 AcceptPro is the latest innovation in secure mobile card acceptance technology. Compatible with more mobile devices than any other secure mobile card reader on the market today, AcceptPro offers the highest levels of security, unmatched reliability and performance, and a comprehensive range of custom branding options. We offer a full range of advanced wireless credit card processing services and equipment for the “mobile” merchants. From plumbers and electricians, to car service operators and trade show exhibitors, our wireless solutions are ideal for anyone receiving payments away from their office or business. Best of all, mobile units qualify to receive face-to-face rates, not the higher “card not present” rates. Utilizing truly state-of-the-art technology, Federated Payments’ SafePay gateway converts your digital device (3g or 4g iPhones, Desktops, Android phones, Laptops) into a real-time card processing terminal. Now you can securely perform a wide range of functions – access orders, issue credits, view transactions, accept checks – anywhere there’s internet access!